Microsoft Office 365 Administration Inside Out – Lost in Updates? It seems like some of the issues that might have been anticipated when Microsoft Press laid off its editorial staff in July 2016 are bearing fruit. At least, some of the promised titles that should have appeared by now have not shown up. And you’ve got to believe that the trauma and upheaval caused by last July’s transition of responsibilities for book production to Pearson (a perfectly capable company) have not been helpful. One of the titles that was expected by now is the long-awaited update for “Microsoft Office 365 Administration Inside Out”. Originally released in October 2013, the current book is now very much out of date. That’s no fault of the authors because the world they wrote about in 2013 is not what we see today. The new book was scheduled for release in October 2016, but I can find no trace of it on Amazon or in any other bookstore, including Microsoft Press’s own online store. Of course, the “Office 365 for IT Pros” eBook team are well aware of the problems of keeping content refreshed and current when it covers a service that is in a state of constant flux. We always thought that the October 2016 date was going to be a stretch because of the fact that Microsoft would make so many announcements about new functionality around the Ignite conference in late September. I guess the original book could have been published with the knowledge that some of the Ignite content would be omitted, the plan being to issue an update soon thereafter. But perhaps the author team decided to wait so that they could document features such as Microsoft Teams and guest user access for Office 365 Groups. If so, it would be nice to know when the book is coming rather than just seeing “unavailable” everywhere. In any case, issuing updated content online and not providing refreshed copies of the PDF, EPUB, and MOBI format books seems like a bad plan. It’s hard for readers to cross-reference and match up new content against an old version of a book and much better when a completely new version is issued. I imagine that the reason why Microsoft Press plans to only issue updates online is to avoid the cost of layout for a new version – and perhaps re-indexing. 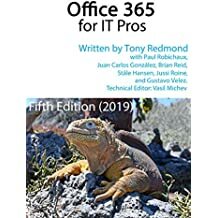 The Office 365 for IT Pros team is interested in seeing what the authors of “Office 365 Administration Inside Out” produce and how Microsoft Press updates the content as promised. By comparison, we update content for Office 365 for IT Pros weekly and we do so by issuing fully-updated PDFs, EPUB, and MOBI (Kindle) formats. We do not index the book anything because the search facilities in eReaders are pretty good at finding information as required. Our latest update is dated 3 December 2016 and is available to anyone who purchased a copy of the third edition. It would be nice to only have to update a book three times in 18 months but I fear that this approach is impractical given the subject matter. Office 365 flexes and changes so quickly that if you don’t keep up, you’d be faced with a massive rewrite every six months. Anyone who looked through the change log for Office 365 for IT Pros will soon realize the volume of change that occurs within the service. It seems better to update weekly and keep pace that way. At least we can say that every update we issue reflects the current state of the art (in our eyes). That’s a nice position to be in. This entry was posted in Cloud, Office 365, Writing and tagged eBook, Microsoft Press, Office 365 Administration Inside Out, Office 365 eBook, Office 365 for IT Pros, Publishing. Bookmark the permalink. 1 Response to Microsoft Office 365 Administration Inside Out – Lost in Updates?